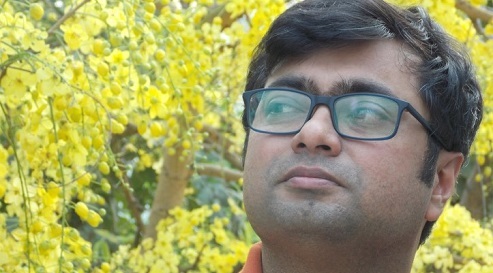 Subhro Bandopadhyay (1978, Calcutta, West Bengal, India) started publishing early. His first chap book dahankhata theke appeared in the 2000. Since then he published four full-length poetry books: jadupaharer gaan (2006), chitabagh shahor (2009), bouddho lekhomala o onyanyo shraman (2012), kacher sarbonam (2014), and a biography of Pablo Neruda: ajana Pablo Neruda (2005) written in Bengali. He received the Indian national award for young writers in 2013 (Sahitya Akademi Yuva Puraskar) for his poetry collection boudho lekhomala o onyanyo shraman. He received the Antonio Machado Poetry Fellowship from the Government of Spain in 2008 and the Poetas de Otros Mundos award in 2014 from Fondo Poético Internacional. He has published two poetry collections in Spain, La ciudad leopardo (Olifante, 2010) and Poemas metálicos (Amargord, 2013) and has been invited to distinguished poetry festivals including the Medellin International Poetry Festival, Colombia and Expoesía, Spain. He teaches Spanish at Instituto Cervantes, New Delhi, he received Diploma Superior of Spanish language from the same institution. Subhro Bandopadhyay participates in the project Poetry Connections India-Wales organized by Literature Across Frontiers and partners to mark the 70th anniversary of independent India.